In the sustainable intensification (SI) of smallholder agroecosystems, researchers and farmers collaborate to produce more food on land currently in cultivation, secure wellbeing in the present day, and bolster ecosystem services to sustain agricultural productivity into the future. In recent years there has been debate in the SI literature about the meaning and boundaries of SI, accompanied by calls for clearly defined metrics to evaluate SI efforts. In this review, Alex Smith, Peter Thorne and Sieglinde Snapp present the current state of the literature in regards to SI metrics. The authors first survey the literature to identify key concepts and qualities associated with SI (referred to as SI indicators). then they briefly discuss indicators that have been sources of contention in the SI literature, and highlight tradeoffs between certain SI indicators. The bulk of the review focuses on identifying measurable properties (referred to as SI metrics) associated with each SI indicator. 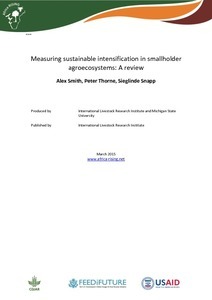 They also identify metrics of broader system-level properties such as sustainability and intensification. They conclude by highlighting gaps in the current literature on SI metrics. Tags: africa rising, ILRI, USAID. Bookmark the permalink. 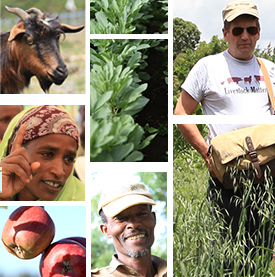 Sustainable intensification of mixed crop livestock systems is a key pathway towards better food security, improved livelihoods and a healthy environment. As part of the US government’s Feed the Future initiative to address hunger and food security issues in sub-Saharan Africa, the US Agency for International Development (USAID) is supporting three multi-stakeholder agricultural research projects to sustainably intensify key African farming systems.